/ Modified oct 10, 2018 4:53 p.m. 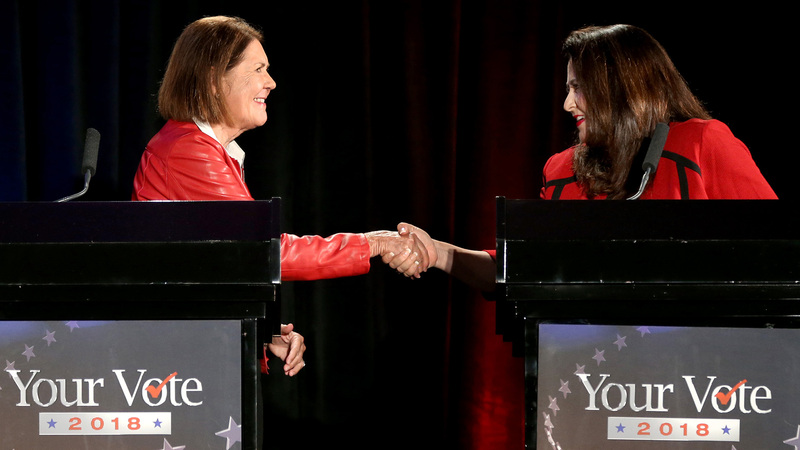 Candidates for the 2nd Congressional District, Democrat Ann Kirkpatrick, left, and Republican Lea Marquez Peterson, shake hands following a televised debate at the Tucson Jewish Community Center, Tuesday, Oct. 9, 2018, Tucson, Arizona. Arizona's 2nd Congressional District is one of the most competitive in the country, and could help decide which party holds the balance of power in the U.S. House of Representatives. When the two candidates vying for the seat faced off in a debate Tuesday night, their contrast on issues was clear. Democrat Ann Kirkpatrick and Republican Ann Kirkpatrick tried to tie one another to their party's positions and leaders, while also hoping to sway voters in a district that has, in the past, been determined by some of the slimmest vote margins in the country. "We're all in this together, we've got to find solutions for the west," Kirkpatrick said when asked about the role Congress and the federal government should play in drought planning. She cited the story of a family that bought land but couldn't get clean water from the faucet due to low water levels from agricultural use. Kirkpatrick called for hearings in Congress, but was not specific about what a drought plan should include. Marquez Peterson said solutions require local and federal partnerships, and said the federal government needs a director of the Bureau of Land Management. "I think decisions about water need to be made locally by local jurisdictions, and they need to be at the table," Marquez Peterson said. The candidates met in a debate cohosted by Arizona Public Media, the Arizona Daily Star, KJZZ and the Arizona Republic. Journalists asked what they would do to ensure Fort Huachuca remains an economic and military asset in Cochise County. The Army installation is one of the largest employers in the county. "Those bases bring about $5 billion, combined, to Southern Arizona. I would fight any effort to close down those bases," Kirkpatrick said. She suggested she would seek an appointment on the House Appropriations Committee, which helps craft the House budget proposal, and specifically said she'd seek a seat on the defense subcommittee to work to keep funding for the bases. Marquez Peterson said she has been on the Southern Arizona Defense Alliance and a member of D-M 50, an organization that works to support Davis-Monthan Air Force Base in Tucson. "We need additional missions. We need to do all we can to support and protect Ft. Huachuca and Davis-Monthan," Marquez peterson said. Cross-border trade is an economic issue in Southern Arizona's congressional districts. The candidates, who are hoping to represent Cochise and parts of Pima County, debated whether the newly announced U.S.-Mexico-Canada trade agreement is an improvement over NAFTA. Marquez Peterson said she supports the new agreement because it keeps the trade relationship. "We did not want to see NAFTA go away, specifically because of the 110,000 jobs I mentioned previously, and the billions of dollars of trade between Southern Arizona and Mexico," she said. Kirkpatrick said she doesn't know what's in the new agreement, and wants to re-examine all of the country's trade negotiations. "Every trade agreement has a winner and loser, and it has to be a transparent process, a public process, so people can know what's in the trade agreement," Kirkpatrick said. The candidates also discussed political issues such as how aligned they are with their party's national leadership, immigration policy and more.